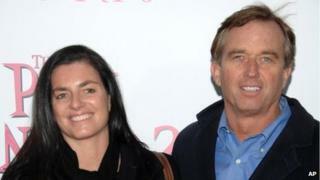 Robert F Kennedy Jr's estranged wife has been found dead at her home in New York state. No cause of death had been released, but US media reported the 52-year-old had been discovered hanged. In a statement, the family of the 52-year-old said her "radiant and creative spirit" would be sorely missed. Mr Kennedy, a lawyer and radio host, is the nephew of President John F Kennedy and son of Senator Robert F Kennedy, both assassinated in the 1960s. His marriage to the former Mary Richardson in 1994, in a ceremony aboard a boat on the Hudson river, was his second. The couple had four children over the 16 years of their marriage before he filed for divorce in 2010. Mary Kennedy, an architect, had brushes with the law over drug and alcohol abuse, and was arrested twice for driving under the influence at about the time they separated. "We deeply regret the death of our beloved sister Mary, whose radiant and creative spirit will be sorely missed by those who loved her," the family said in a statement issued by lawyer Kerry Lawrence, who had represented Mary Kennedy in a drink-driving case. "Our heart goes out to her children who she loved without reservation." A neighbour, Leslie Lampert, told the Associated Press news agency that Kennedy was "community oriented" and "a lovely individual". "She was always kind in our presence." Police confirmed a body had been found on the Kennedys' property in Bedford, north of New York City, but would not release the name. The incident was under investigation by the Bedford Police Department with assistance from the Westchester County Medical Examiner's Office. An autopsy is scheduled for Thursday. US broadcaster ABC News cited a family member and other sources as saying Kennedy appeared to have hanged herself. She was found inside a barn behind the family home, according to the New York Daily News .